Edmund Hillary was one of the greatest explorers and mountaineers of the twentieth century. His conquest of Mount Everest and the South Pole inspired generations of adventurers and dreamers. Edmund Hillary was born in Auckland, New Zealand, on July 20, 1919. He spent his childhood in Tuakau, a rural area just south of Auckland where he went to the local primary school. Hillary was gifted with an active imagination and had a passion for reading adventure stories. Later he traveled daily to the city for secondary schooling, where he was a shy and awkward boy. As a child he helped in his father's beekeeping business and eventually quit school to work with his father full-time. In 1935, during a ski weekend on a school trip to Mount Ruapehu, Hillary discovered his joy in the mountains and it never left him. He would often escape to the mountains to enjoy skiing and hiking, and he developed a love of climbing. A few years later he climbed his first mountain, the 7,500-foot Mount Oliver in New Zealand. Hillary enlisted with the Royal New Zealand Air Force in World War II (1939–45), where New Zealand aided the Allied powers of America, England, and Russia in their war against the Axis powers of Germany, Italy, and Japan. While serving as a navigator in the South Pacific, he was wounded in battle. Despite the physical setback, Hillary was determined to make a full recovery and resume mountain climbing. During the 1940s, Hillary made many climbs in New Zealand, particularly in the Southern Alps. He quickly became recognized for his daring, strength, and reliability. Then came climbs in Europe that brought the invitation to join Sir John Hunt's expedition to Mount Everest, in the Himalaya Mountains in Nepal. For two years, Hillary joined Hunt in the Scottish Highlands to prepare themselves for Everest. The highest point on Earth, Mount Everest measures 29,028 feet high, roughly six miles. No one in history had successfully completed the climb, and many lives were lost during attempts. Famed climbers George Malloy and Andrew Irvine came close before they disappeared somewhere near the mountain's peak. In March 1953, Hillary and Hunt, along with twenty other of the best climbers in the world, gathered at Everest. Their company also included 350 Nepalese workers carrying 10,000 pounds of food and equipment, as well as thirty-six Sherpas, people who are familiar with the rugged terrain and are invaluable guides for climbers. With the party's base camp just 1,100 feet from the summit, Hunt sent a two-man team the rest of the way. They failed but returned to camp with valuable information about how to attack the summit. Next, Hunt chose Hillary and Sherpa guide Tenzing Norgay (1914–1986) to make an attempt. After a heroic and death-defying climb, the two reached the summit on May 29, 1953, becoming the first two people to reach the top of the world. After the Everest expedition, Hillary gained worldwide fame and a reputation as an adventurer. Vivian Fuchs, who later would be knighted, asked Hillary to become part of the Trans-Antarctic expedition in 1957 and 1958 that would cross the southern Atlantic Ocean to the South Pole. Hillary's job was to set up supply dumps from base camp towards the South Pole so that Fuchs's party could complete the crossing of Antarctica. Hillary wanted to use the sophisticated Snow-Cats available to Fuchs, but he had to settle for Ferguson farm tractors for transport and hauling. When the last dump was established, Hillary made his own decision to head for the Pole, which he reached with his three tractors on January 4, 1958. He was the first person to travel there by land in forty-six years. Through the 1960s and 1970s, Hillary continued to explore the Himalayas. He also led a renowned expedition by jet boat and on foot from the mouth of the Ganges River to its source. Like his other adventures, it was animated by his zest, good humor, and joy. Although Hillary had achieved worldwide fame for his adventures, he never lost touch with the Nepalese people and devoted much of his time to their environmental and social causes. Hillary built hospitals and schools in the mountains of Nepal by raising the money, buying the materials, and working on many of the buildings. Hillary also expressed social concerns in New Zealand by commenting on public issues. His observations were noted for their simplicity and good sense. He was president of Volunteer Service Abroad and patron of an Outdoor Pursuit Centre and of the Race Relations Council. He was also active in the Family Planning Association and in conservation campaigns. He was strongly opposed to nuclear tests and to ocean dumping in the South Pacific or elsewhere. Hillary's achievements were recognized internationally with the award of numerous decorations and honorary degrees, beginning with his knighthood in 1953. They reflect the rare warmth and respect in which he was held. In 1985 he was appointed New Zealand high commissioner to India. He was also honorary president for New York's Explorers Club. In 1975 Hillary's wife and teenage daughter were killed in an airplane crash. He later remarried, and after leading one last expedition in 1977, he retired to his bee farm outside of Auckland. Hillary remains an important voice in the sport of mountain climbing, even in retirement. He wrote the forward for a book by Helen Thayer titled Polar Dream (1993). In 1996 he reacted to the death of eight mountain climbers in a storm on Mount Everest with the comment to Time 's David Van Biema, "I have a feeling that people have been getting just a little too casual about Mount Everest. This incident will bring them to regard it rather more seriously." Hillary has also remained active in the region where he made his famous climb. The Sir Edmund Hillary Himalayan Trust provides funds and expertise to support reforestation, build schools and hospitals, and use technology such as solar power. He personally raised funds for the Nepalese people throughout the 1990s through public speaking engagements and lectures in the United States. In a 1995 interview with James Clash, Hillary said, "I think the most worthwhile things I've done have not been on the mountains or in the Antarctic, but doing projects with my friends, the Sherpa people. The twenty-seven schools we've now established, the hospitals—those are the things I would like to be remembered for." 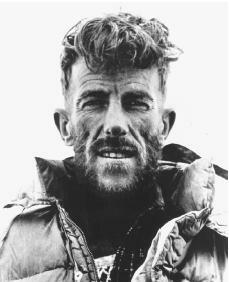 Gaffney, Timothy R. Edmund Hillary. Chicago: Children's Press, 1990. Hillary, Edmund. Nothing Venture, Nothing Win. New York: Coward, McCann & Geoghegan, 1975. Hillary, Edmund. View from the Summit. London: Doubleday, 1999. Kamler, Kenneth. Doctor on Everest. New York: Lyons Press, 2000. Moon, Kenneth. Man of Everest: The Story of Sir Edmund Hillary. London: Lutterworth Press, 1962. Sufrin, Mark. To the Top of the World: Sir Edmund Hillary and the Conquest of Everest. New York: Platt & Munk, 1966. This web site helped me so much with my project and i would highly recomend it anyone in need of information on SIr Edmund Hillary. Heyerdahl, Thor Hinton, S. E.